Solitaire engagement ring in yellow gold: simple and elegant, but with rounded edges on either side of the center stone to give it an artistic and contemporary feel as well. 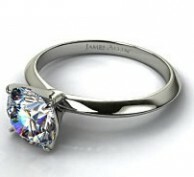 This ring looks great without being overwhelming, and it's also versatile -- set it with a diamond of almost any shape. 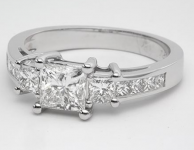 12 channel-set diamonds add sparkle to the platinum band that decorates and holds your center diamond. The channel-set diamonds are round, but you can choose a diamond of any shape to set in the center of this ring. 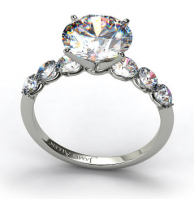 Stunning engagement ring with 3 sidestones on either side of your center diamond to add additional sparkle and emphasize the beauty of your center stone. 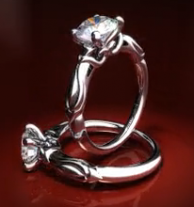 This ring can be set with a diamond of any shape. Beautiful, full-sized pave diamonds decorate the band of this spectacularly sparkling platinum engagement ring. Choose a round, princess, asscher, radiant, or cushion cut diamond to set in the center of this ring and you'll have an amazing engagement ring! Very nice engagement ring with 8 channel set diamonds that taper up to the center diamond to make a bow tie shape. Simple but striking, this platinum three stone princess cut engagement ring gives you complete control as you can select all 3 diamonds. Four baguette sidestones complement your center diamond in this classic engagement ring. This solitaire engagement ring features a 18k yellow gold band to provide a gorgeous contrast to the center diamond that you choose to grace this ring. 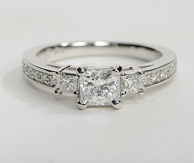 This setting can be set with a round, princess, cushion, Asscher, emerald, oval, or radiant shaped diamond. Two perfectly-matched pear-shaped sapphires sit on either side of your center diamond, making for a distinctive look with its blue color when compared to other colorless rings. 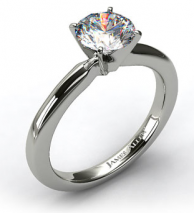 The platinum setting has a nice weight that will feel great on her finger!